Pioneer announced its latest DJ mixer this morning, and in a matter of hours we had our hands on it. 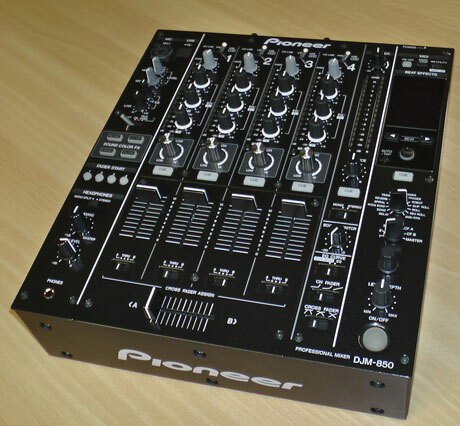 Hailed as the successor to the extremely popular DJM-800, the mixer that seems to dominate clubland, the DJM-850 has lost some features seen on the 800 and gained others. One feature that it’s gained is the same four stereo in and four stereo out audio interface as the DJM-900, and the good news is that it’s Traktor certified. At least, it will be come April, according to Pioneer. It also gets some of the DJM-900’s effects, as well as an additional Pitch Echo effect and a beat button for every colour effect that gates the colour effect according to the beat of the track playing through it. What it loses is the DJM-800’s digital inputs. The DJM-850’s control surface is much the same as the DJM-850 that it replaces, which is no bad thing because it means fans of the original can quickly get to grips with the mixer and concentrate on the new features straight away. It has beautifully smooth faders, a tough, heavy build and high quality selectors – everything you expect from a club-level Pioneer mixer. Even the FX controls look and feel the same, although the way you control the level of the effects has changed. When the Level/Depth dial is at the 12 O’clock position, the level of the effect is at 100%. From there, you can twist it further to the right to add an extra element to the effect, with that element being dependent on the effect you’re using. An extra feature is the ability to tap in a decimal figure for the BPM. This is handy if you have Rekordbox-analysed files playing on a CDJ-2000, giving you a specific BPM for that track. You can then tap that BPM into the DJM-850 to increase the timing accuracy of the DJM-850’s beat effects. We’ve seen it done with our own eyes and it looks straightforward, but we’ll be trying it for ourselves in our review. Much has been said about the DJM-850’s place in the Pioneer line-up, but it’s simply an update of the DJM-800 that gives it the latest features that modern DJs want. It isn’t meant to be a revolutionary new mixer with heaps of new features. 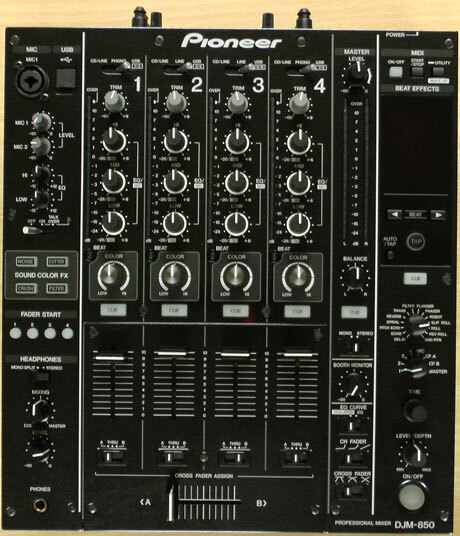 Pioneer still intends the DJM-900 to be the club mixer and sees the DJM-850 as a personal and mobile mixer. Considering its price, however, we can definitely see many smaller bars replacing their battered DJM-800s with this updated model, especially given its Traktor-certified audio interface. Unfortunately, the DJM-850 is not compatible with Rekordbox, which means the DJM-900 and DJM-2000 are still the mixers you should choose if you own CDJ-900s or CDJ-2000s and want to make best use of Rekordbox-analysed tracks. Please note that the above is not a review, but a first hands-on look at the DJM-850. We can say that it seems to be a worthwhile update to much loved mixer. Sadly, we don’t have the necessary software for it to communicate with our laptops yet, but we’re getting it and we’ll bring you the review as soon as we can. Head to head vs. x1600 planned? "The DJM-850’s control surface is much the same as the DJM-850 that it replaces"
they just used some old parts and changed a few circuit boards with new ones (probably from the nexus) and packaged it up at $2000. This should only be $999 at best. Wow...2K for this? Did they even give you a plug so we can see all the pretty lights? But on the real, I've got a DJM 707, rock solid for 4 years now. Pioneer is quality...but 2k is a bit excessive. It's not going to be $2000. The DJM900's MSRP is $2,399 and it sells for $1,999 (and even less at non-authorized retailers) The DJM850 will probably sell for $1,599 at retail. Still expensive, but not $2,000, and if I'm right about the price it's going to be the reason I finally upgrade from my DJM700. I'd love the 900 but it's not worth $400 more than this... 1.) digital inputs are meaningless, 2.) I don't use Rekordbox so the LINK and Quantize EFX features are meaningless to me (and anyone else that doesn't use Rekordbox), 3.) the X-Pad is awesome but not something I NEED, 4.) Yes, it's missing the Dub Echo from the 900, the one thing on the 900 I'd really want on the 800, but come on, I've been deejaying for 15 years without it just fine (and I have a REAL Roland RE-201 at my disposal if I really wanted to use it live). Im sticking with a tech 1210 mk3d and a 1210 mk2 a beat up vestax 06 pro and my laptop and Traktor my set up is PURE I love it so if you can mix on my set up you can mix on anything !!!!!!!!!! Regarding where it sits in the line-up I think Pioneer is starting to line things up nicely. The top pro tier with CDJ-2000 and DJM-2000. The middle pro tier with CDJ-900 and DJM-900. The entry level pro tier with CDJ-850 and DJM-850. Then you got the non pro true entry level stuff. what makes the 900 nexus at a higher level than the 850 mixer. Yes the 850 lacks digital inputs and link as well as the x pad. But it still has the same sound quality same durability and build as the 900. Also it has the same popular effects as the 900 such as the slip roll and spiral. Trust me no one is going to miss the melodic feature. The new echo up effect will be a lot more useful than that awful melodic effect. Also the beat color effects adds something extra which is almost equivalent in my opinion to what the x pad adds to the 900 nexus. I am a owner of the djm 900 nexus and I do love it but to be honest the djm 850 has everything that I like on the 900 nexus and more. I will miss the x pad if I do decide to part ways but other than that digital inputs are useless in my opinion and the link feature is pointless if you use DVS which most do why would you need a link. 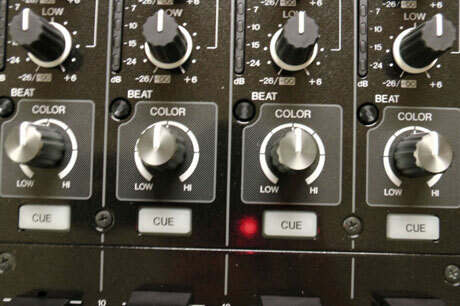 What makes the VMX-100 a higher level mixer than the DJM-850? People both mixers are equivalent in terms of features durabilty and performance. The only difference is the small price gap..yes the VMX-100 is a bit more expensive but hey the DJM-850 is still a decent piece of gear. Just so you guys know this is retailing for $1,699 (USD) out of the gate, not $2,000. Some retailers are already taking reservations that that price and I bet it will be less once it's been released and on the market for a few months. That's still a lot of money, but not $2,000.